I've recently been inspired by a friend on Facebook. She has been working on decluttering her house by filling a bag a day for 40 days! While I know I don't have the time or dedication to work on this for 40 days straight, I'm sure I could fill 40 bags of clutter! Whenever I start feeling the effects of stress on my life, the clutter around me is what gets to me first. When I haven't gotten enough sleep, it's the clutter that frustrates me the most. Clutter collects all around us. It comes in the form of toys, kitchen gadgets, decorative items, and even clothes. 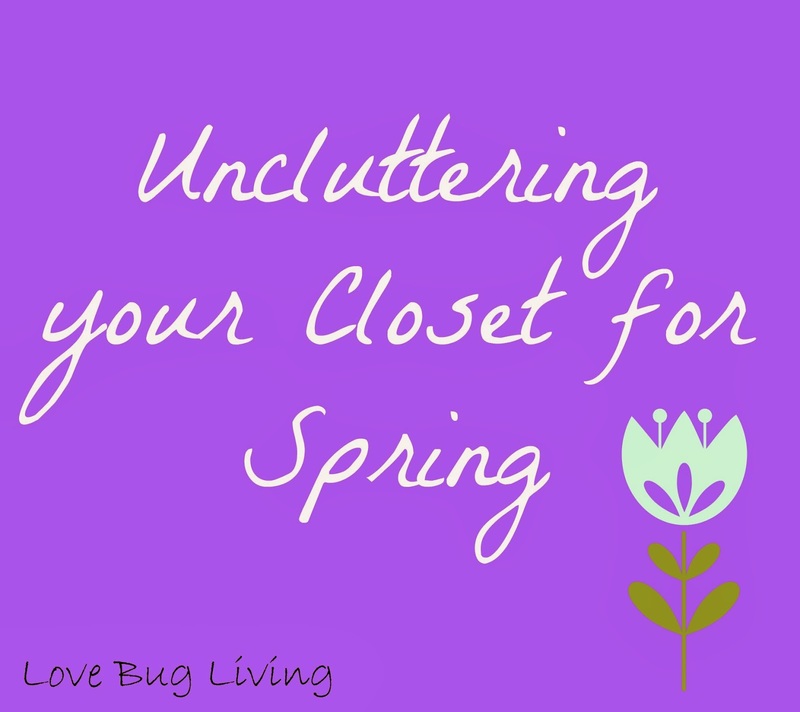 While there are many areas that I need to declutter, I've started by uncluttering my closet. I'm hoping to make my life a bit simpler and maybe make it easier to find something to wear. I don't really have a large chunk of time to dedicate emptying out my closet and going through it all at once, so I am doing it a section at a time. That way the task seems a little bit less daunting. You can work on this whenever you have a bit of extra time. It also might help to recruit the help of an honest friend. Some friends may trade their services for a glass of wine! It's now time to start the purge! I work on a section at a time. Start with dresses or shoes or wherever you can make the biggest impact. You are going to be making a few piles: Keep, Maybe, Toss, and Donate. Torn, badly stained, and damaged items should go in the toss pile. Items that are still useful to someone, even if it's not you, can go in the donate pile. The maybe pile is for the items you can't rule out just yet. The keep pile is for your definites. When critiquing your clothing, be honest. This is where your honest friend will come in handy. The first round will be the easiest. First pull out all of the items that you can't believe you still have and the items in poor condition. Next decide which items are out of style, don't fit your style or you know you just won't wear anymore. It will feel good to get these items out of the way. Now it's time to try on everything you have left. Do these items still fit? Are they flattering? Is it still your style? Do you feel good when you wear it? It can be tough to toss certain items, but ask yourself what is the reason you are really holding on to it? Go through your dresses, pants, tops, and coats. Don't stop there. Don't forget your bags, shoes, belts, and jewelry. Accessories can get cluttered just like everything else. Once you've finished your piles, it's time to put them where they need to go. The toss pile is easy. The donation pile can be split even more. Have any items that are still in style and have value? These items may be able to be brought to a consignment store and sold, earning you a portion of the sale. There may be a number of consignment stores in your area. Check with the store or website for their terms. You will also need to find out what type of items they accept and how their process works. Another option is consignment sales. I've participated in one called Just Between Friends, that happens twice a year. This sale is mostly for children's clothes and items. I've had great luck selling items that I don't need anymore and at better prices than a garage sale. Although, a garage sale is another great option if you are uncluttering your whole house. Have any designer items that are 10 or more years old? You might be better to take these to a vintage store. These type of stores have become very popular and you will probably get a better price for these type items at a specialty store. Now, how about the rest of it? I hate to throw out anything that might be useful to someone else. Drives me crazy! I've picked up items people have put in the trash, just to donate it. Just seems so wasteful to me. There are many options for you to donate your leftover items. You many know friends or family that would love to get your hand me downs. I've received bags of kids clothes from friends and it's always like Christmas in our house going through the items to see what we can use. If you don't know anyone personally, you might check with your church to see if they are collecting donations for anyone. I have donated old school uniforms to my girls' school that they pass on to students that need them. Also check in to local homeless or women's shelters to see if they are accepting items. Warm clothing items and maybe even blankets might be needed here. Have formal or semi-formal dresses or even a wedding dress to donate? There are organizations such as Donate my Dress that accept donations and give them to girls who could not otherwise afford them. You can always donate to Goodwill or Salvation Army, but there are also many smaller charities that are happy to accept your donations. After removing your toss and donation piles, you will be left with a maybe pile. Now is the time to be critical. Have you worn this item in the last 6 months? Is it something you need? Will you actually wear it? Does it fit correctly? After trying them on, move them to the keep or donate pile. Now it's time to get everything back into your closet. Organization is the key! I put my clothes in my closet by category. Shirts are all in together starting with my sleeveless, light colors to dark. Then short sleeved tops, light to dark and finally long sleeved. 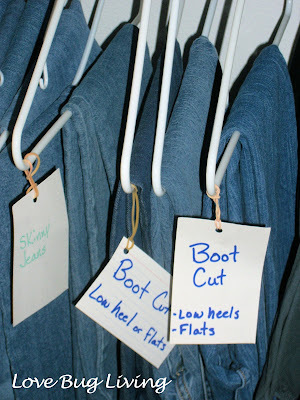 Organizing by style and color will make them easier to find when you need them. I do the same with my dresses and pants. I've even labeled my jeans by style, so it's easier to find the right pair. Fold sweaters and knit dresses to keep them from stretching. I also fold my sweatshirts, t-shirts, shorts, lounge wear, and any other items that I'm not worried about wrinkling. Organizing your shoes and accessories is just as important. Clear plastic shoe boxes are a great way to store your shoes and are easy to stack. You can always add a picture of the shoes on the side of the box for easy reference. Living in Florida, I wear mostly flip flops. 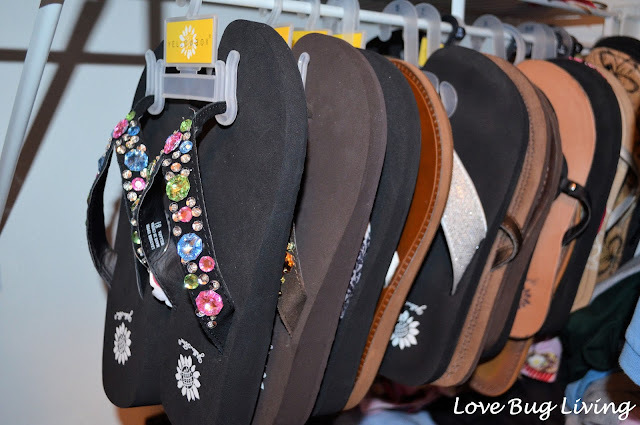 I use a small hanging section of unused space as flip flop storage. The white closet racks are perfect for this. I have a few purses, and not as much space to keep them. I now keep them on a top shelf in a clear plastic bin, but I have a booklet of pictures of them to reference what I have. Sounds kind of crazy, but it does help me find the perfect purse for my outfit. 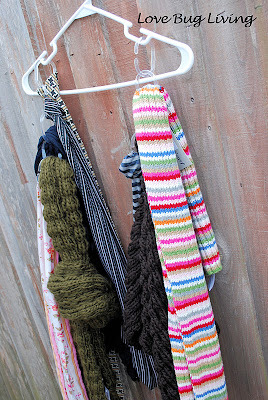 I've also created a Hanging Scarf Organizer to keep my scarves accessible. This also hangs in my closet, keeping the clutter out of sight. I have an awesome full length mirror that opens to reveal a jewelry cabinet. 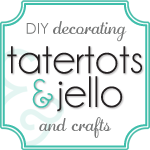 It is a great way to store lots of jewelry and keep it from tangling. Other options would be a jewelry hanger that has tons of pouches for each item. They can be hung in your closet to keep the clutter to a minimum. If you have extra drawer space, you can also use jewelry trays to get organized. This whole process could take you a weekend or it could take you weeks, but you will truly feel lighter and more accomplished when you are done. Donating and helping others may be just enough to make it worth it. I know I feel better every time I get rid of something that I just don't need.